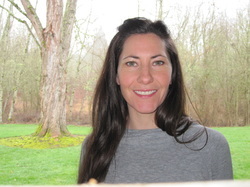 Trish teaches our Saturday 9:30am "Hatha Flow" class. She has been practicing yoga since 1994 and teaching for the last 9 years. Her kind and gentle manner is suitable for students at all levels and abilities. Her teaching style offers clear instruction, with an emphasis on awareness of physical sensations, emotions and thoughts that arise throughout the practice. When the time called to teach, Trish travelled to India and received her first 200-­hour certification from Yoga Vidya Gurukul. Wishing to help others in more ways, Trish was drawn to the teachings of Joseph & Lillian LePage of Integrative Yoga Therapy. With them, she completed a 1000­-hour yoga therapy certification. Currently, Trish is pursuing a Professional Trauma Certification through the Somatic Experiencing Trauma Institute.